One of the world's most-beloved filmmakers, Guillermo del Toro is at his peak in this return to his fairy-tale roots – and his first movie to be made in the English language. 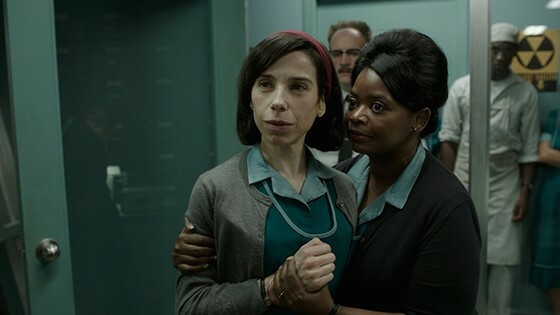 The fable, set against the backdrop of Cold War era America circa 1962, stars Sally Hawkins as the lonely Elisa, a mute janitor in a hidden high-security government laboratory in Baltimore. Her solitary life takes a sudden turn when she and co-worker Zelda (Octavia Spencer) discover a classified experiment: a strange amphibious being in a water tank. It's not long before Elisa dives into the deep end of this emotionally powerful romantic fantasy, elevated by del Toro's always fantastical and poetic visual gifts. The film is the selection of KWFF special guest critic Kenneth Turan, of the Los Angeles Times and NPR's Morning Edition.